Myotonic dystrophy is one of the most common dominant neuromuscular disorders that results in muscle dysfunction. 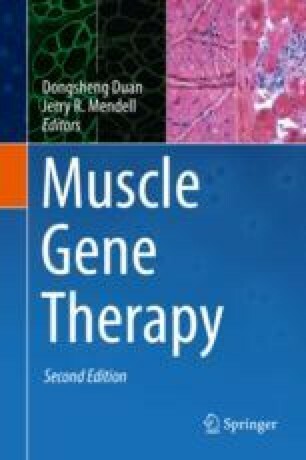 Myotonic dystrophy type 1 (DM1) or Steinert’s disease is caused by an expanded CTG repeats in the 3′ untranslated region of the dystrophia myotonica protein kinase (DMPK) gene, whereas myotonic dystrophy type (DM2) is caused by expanded CCTG repeats in the first intron of the CCHC-type zinc finger, nucleic acid-binding protein (CNBP) gene. The clinical manifestations worsen with each generation (anticipation) consistent with an expansion of the repeats. The tri- or tetranucleotide repeat expansion results in gain-of-function pathogenic RNAs which are retained in the nuclei and sequester RNA-binding proteins such as MBNL and CUGBP that interfere with splicing. Unfortunately, there is currently no cure available for these dominant neuromuscular diseases. Nevertheless, some promising therapeutic strategies have been developed that are aimed at directly tackling the genetic cause of the disease. In particular, antisense oligonucleotide technologies, gene therapy, and gene editing or small molecules are being explored. Recently, a phase 1/2a clinical trial has been completed that is based on the premise of promoting RNase-H-mediated degradation of the expanded CUG transcripts using antisense oligonucleotides. In this review, we summarize the current progress on different cellular and animal models as well as various therapeutic strategies for DM with specific emphasis on gene therapy and gene editing approaches using TALENs and CRISPR/Cas9. Lastly, translational challenges and future promising therapeutic avenues are discussed. Some of the research described herein was conducted in the laboratories of TV and MC. This research was supported by grants from the Research Foundation of Flanders (FWO), Association Française contre les Myopathies (AFM), Scientific Fund Willy Gepts (WFWG, VUB), and King Boudewijn Foundation—Walter Pyleman Fund. YCC is supported by the IOF-GEAR grant (Vrije Universiteit Brussel); SD is supported by the PhD studentship of the Willy Gepts Fund (Wetenschappelijk Fonds Willy Gepts—Vrije Universiteit Brussel) and the King Boudewijn Foundation Walter Pyleman Fund. This project has received funding from the European Union’s Horizon 2020 research and innovation program under grant agreement No 667751 (MYOCURE).